Step-by-step Delphi programming tutorial for beginners, in HTML-format and with GIF-images. Learn iPhone App Development with 100 complete iPhone SDK projects to help beginner iPhone programmers. Includes concepts from sound effects, iphone accelerometer, animation, playing movies and more! Just BASIC is an ideal personal Windows Programming tool and Tutorial. Great for light Programming and teaching or learning Programming. Create your own utilities, games, business apps and more. Includes a syntax coloring editor, a debugger, and a customizable GUI editor. Large online community. Produces standalone applications. Network Programming Gear,Free YourSelf From network programming Now! Quest lets you create sophisticated text-based games, without having to program. Make text adventures, role-playing games, training materials, simulations, interactive fiction, online multiplayer environments and more. Full tutorial included. MediaMixer: Without programming, produce mind-blowing interactives multimedia presentations (or animations). Assemble pictures, videos, sounds, texts, various animations by filling in a grid. Distribute freely on cd-rom or by email. Super AJAX Programming Seed is a tight little program that illustrates a simple implementation of AJAX technology using HTML and PHP, and offers suggestions for how to use the technology to make super-dynamic web applications from scratch. It's a lot of fun, and after seeing how simple it is you'll never stop coming up with new ways to use it. This free tutorial helps you master basic computer mouse skills including copy and paste, drag and drop, and double click. Basics4Beginners.com is a web site dedicated to FREE interactive help and training for people new to computers. This free Tutorial helps you master basic computer mouse skills including copy and paste, drag and drop, and double click. Basics 4 Beginners is a web site dedicated to FREE interactive help and training for people new to computers. Visit us as www.basics4beginners.com for many more interactive training guides. TwinPlayer: Without programming, produce online or offline interactives multimedia presentations. Assemble pictures, videos, sounds, texts, animations by filling in a grid. Distribute your creations offline (single file) or upload them to the web. Without programming, produce with WebMixer web interactives multimedia presentations or animations. Assemble pictures, videos, sounds, texts, animations by filling in a grid. When diffusing, WebMixer compress and upload the project to your web site. create professional demos and tutorials without programming knowledge. There are no complicated interfaces and your demonstration or presentation could be ready in just minutes. 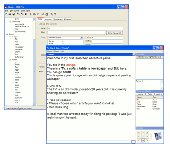 Page Popup Maker generates the all the code needed to create several types of pop up windows. Anyone can create popup scripts without any programming skills, all you need is a couple of minutes to add popups to your web site. SynthMaker is an audio programming tool that allows anyone to create their own sounds, virtual instruments and effects without having to write any code. Powerful Windows application builder and multimedia authoring tool for creating utilities, interactive presentations, catalogs, newsletters, ebooks, training materials, etc. Built-in compiler creates stand-alone Windows exes. Royalty-free. Database Development, Administration, PL/SQL programming and data analysis tool for Oracle 8.0, 8i, 9i and 10g. Are Browse the database for 32 different types of objects such as table, view, synonym, constraints, function, index, trigger, etc. PPL is a fast and easy-to-learn programming language that is fully object-oriented. PPL runs on all PocketPCs using Windows Mobile 2000, 2002, 2003, 2003SE, and WM2005. PPL is also compatible with PC desktop computers.